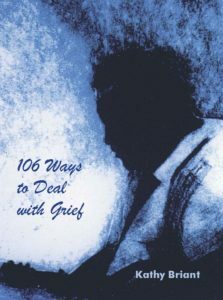 Drawn from personal experience and from that of others who experienced the loss of a loved one, author Kathy Briant lists 106 ways to deal with grief. Easy to read, yet poignant, using insight gained from experience, and knowing first hand the suffering that people in the midst of grief go through, these 106 suggestions are a good addition to the literature on grief. Realistic, at times blunt, but also sprinkled with humour, the statements are always heartfelt and designed to throw a lifeline to a person undergoing a terrible experience. Those experiencing grief and not knowing what to do or what to expect will gain support, understanding and help from this book. Often people suffering from grief cannot concentrate long enough to read a full book, but in short, easy to understand sentences, everyone will find a statement or two that will help them hang on in stormy seas. As well, those friends, family or professionals working with people in grief will come to further understand and accept people who are undergoing one of the worst experiences in their lives. If you don’t know what to do for someone in the throes of grief, give them this book. Price: $12.95 CAD + $4 shipping and handling within Canada.